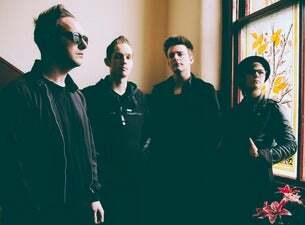 Glasvegas are a Scottish indie rock band from Glasgow. The band consists of James Allan (vocals), Rab Allan (lead guitar), Paul Donoghue (bass guitar) and Jonna Löfgren (drums). The band received critical acclaim for their platinum selling debut album "Glasvegas" which was released in September 2008, reaching No. 2 in the UK Album Charts. Their debut was also nominated for the Mercury Music Prize in September 2009. Glasvegas also released a a 6 track Christmas E.P "A Snowflake Fell (And It Felt Like A Kiss)" in December 2008 which was recorded in a castle in the Transylvania, Romania. The release on 4th April 2011 of their critically acclaimed second album "Euphoric /// Heartbreak " saw the the band reach No.10 in the UK and No.1 in Sweden. Lauded for their unique sound and powerful lyrical content Glasvegas have a fervent and loyal fan base which has meant the band have embarked on several world tours including a trip to China and to date they have also toured North America an unprecedented seven times. The band released their 3rd album "Later…When The TV Turns To Static" in September 2013.